For 2018, Buick Regal benefitted from a thorough makeover. What was previously an impressive midsize sedan is now an elegant hatchback that looks more like a fastback. Buick calls it the Sportback. And the performance-minded Regal GS is back, with a V6 engine, all-wheel drive, upgraded chassis, and more aggressive looks. But more than that, and better too, there is a new model: the TourX wagon. The new Regal TourX is the first Buick wagon since the classic and beloved Roadmaster Estate land-yacht rumbled and wallowed over our highways. It faded into obsolescence a quarter century ago, driven there by the coming of the Subaru Outback and the SUV movement. Today wagons are coming back, because they make sense. With an engine less than half the size (closer to one-third) of the V8 Roadmaster, the TourX is a worthy successor. The Roadmaster was special because it was unique, but the TourX is special because it matches the European competition. Well, actually, it is the European competition. It’s made in Germany by Opel. That not only explains why it’s good, it also makes this Buick a threat to national security, says our president. The TourX looks like a Volvo wagon but prettier, with a relatively subdued and classy Buick waterfall grille with winged tri-shield emblem. The interior is comfortable and nicely designed, and the ride is sleek. It compares very well against the Volvo V60 Cross Country, Audi A4 Allroad, BMW 3-Series Sport Wagon, and Subaru Outback. It isn’t the best in every area, but it’s number one in cargo space, quarter-mile acceleration, fuel mileage (by our measure), and beaten only in base price by the four-cylinder Outback (but not the six-cylinder Outback). The TourX comes only as all-wheel drive, using a sophisticated twin-clutch system. It’s powered by a new 2.0-liter turbo making 250 horsepower and 295 pound-feet of torque, mated to a Japanese Aisin 8-speed automatic transmission. The Sportback and GS hatchback/sedan models use another engine, transmission, and suspension, and their seating and cargo space is entirely different, so we review them separately. The TourX hasn’t been crash-tested yet, however the 2017 Regal aced its crash tests, and the TourX uses the same chassis. It’s EPA-rated at 21 city, 29 highway and 24 combined miles per gallon, but we got better than that. We topped 29 mpg with the cruise control set at 73 mph for a full day, and averaged 26.7 mph during our week in the car, which included a road trip and city driving. The TourX base price is just $29,995, and for that it comes well equipped, but in just one color: white; any other color is extra. Even the $33,595 Preferred model still has cloth upholstery, but it adds Apple CarPlay and Android Auto capability. Our test model was an Essence with a base price of $35,020 that included leather seats, adaptive cruise control, power liftgate with lamp, remote start, 8-inch touchscreen (7-inch is standard) and safety features such as automatic emergency braking. It topped out at $39,160 after the Driver Self-Confidence package (LED headlamps with auto-dimming and cornering capability, rear park assist, blind-spot monitoring, lane-change alert, and more), Sights and Sound package (premium audio, Buick infotainment, HD satellite radio, Navigation), and $925 delivery charge. A fully loaded TourX can top $42,000. The TourX is strikingly handsome: sleek, distinct and composed, with strong character scallops in the doors. We could do without the matt-black plastic cladding over the fenders, an apparent attempt to make it look like a crossover, which it isn’t. Or, in Buick marketing-speak, “ruggedly styled to redefine what capability can look like.” Our test car was a classy Smoked Pearl Metallic (titanium), costing an extra $395, probably worth it because the fender cladding was less conspicuous against a dark color. A discreet chrome strip runs from the A-pillar over the windows and down to the taillamps, emphasizing the long and low profile. There are cool-looking exhaust openings in the rear bumper, but they aren’t real. The waterfall grille does a superb job of owning the name Buick; it’s the right size for a wagon, with the right lines and right emblem. With 33.7 cubic feet behind the rear seat and 73.5 cubic feet behind the front seat with the rear seat folded (more than a Mercedes E-Class wagon), the TourX can bring home or take away most anything. You can sleep in it. There’s an excellent 39 inches of headroom, and decent 37 inches of rear legroom. There are some nice details, such as switches that fold down the rear seats, and sliding tie-downs on the cargo floor. The leather front seats in the Essence model have good bolstering, a bit firm and flat but still comfortable for long hours; our road trip was 5.5 hours each way, and we felt fine. However we wish we had been able to test a base or Preferred model with the cloth upholstery, as they are attractive models to buy, to keep the price down. The cabin materials aren’t conspicuously inexpensive, but they’re not the quality of Audi or Volvo, let alone Mercedes. They’re about Subaru level. There are some hard plastics on the dash, while the door panels are touched by sweeping lines and satin metallic trim that suggest upscale. Other choices in trims include piano-black plastic or a dark wood called Kibo. The cabin is quiet, and the controls are easy and intuitive, with the Essence model’s infotainment offering smooth integration of the buttons, screens and technology. The center console is well designed, and the XM radio is easy to tune, which is always a relief in the cars we test. The low instrument panel holds crisp gauges with LED lighting, while the centerstack is framed with more high-quality trim. An available 8.0-inch LCD touchscreen dominates the dash, while a 4.2-inch screen between the gauges displays information from the available navigation, phone, and audio systems. A WiFi hotspot is standard; we used it with our laptop, and liked it. The 2.0-liter twin-scroll turbo sounds softly gruff at slow speeds, but it becomes smooth and seamless with the throttle down, revs easily, and accelerates from zero to sixty in a quick 6.4 seconds. Last year the Regal offered an optional 2.0-liter turbo, borrowed from Cadillac, but the specs were different; the 2018 turbo makes a bit less horsepower and the same peak torque, however that torque comes at 3000-4000 rpm, instead of the Cadillac engine’s low-down 1700 rpm. The engine features start-stop technology to save fuel. We won’t say it’s rough, but we’ve felt better. The 8-speed transmission manages the engine, as long as the driving is casual. 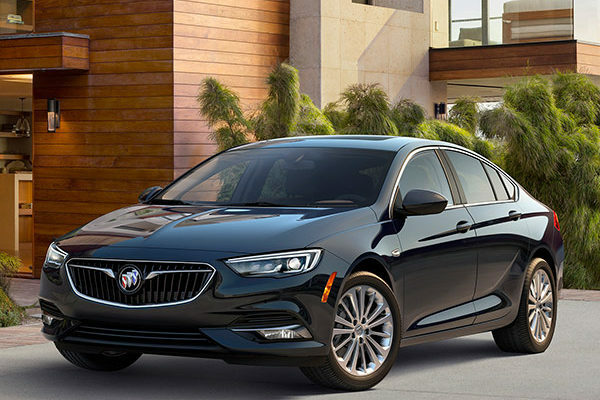 The transmission lacks paddle shifters, which we think it should have, if Buick wants to attract new and sportier buyers. The 8-speed isn’t as quick or responsive as it should be; in fact, Buick says that the 9-speed that’s in the two-wheel-drive Sportbacks will soon be in the TourX. Which might tell you all you need to know about the 8-speed. Cornering is fairly responsive, with some lean, but the TourX is more of a cruiser than a sport wagon. The electric power steering isn’t heavy, and the steering ratio isn’t too quick. The car’s fairly light weight of about 3750 pounds helps the handling. The ride on a smooth road has the quality of a good German sedan, using struts in front and a multi-link rear suspension. But not so on a bumpy road; the springs are fairly soft, and easily challenged by rough roads and corners. The twin-clutch rear axle with torque vectoring is a good thing in this situation. The intelligent all-wheel-drive system can send up to 90 percent of power to the rear wheels, as well as varying the torque between them, using a limited-slip differential. It keeps the TourX stable on bouncy roads, and aids in foul-weather traction. The TourX rides on standard 18-inch wheels and tires, with more ground clearance than the Sportback (like the Outback vs Legacy), but it’s by no means an off-roader. The new Buick TourX, a basically German car with an American engine and Japanese transmission, hits a triple. It’s very stylish, efficient, quick and affordable. It’s a solid contender against the likes of Volvo, Audi and especially Subaru. Without meaning to sound chauvinistic, we think the new 2.0-liter turbo might be the best thing about it. But the TourX could be better, and we won’t be surprised if it turns the triple into homer for 2019.